I hardly know where to start this post because it has been a week of poppy spree madness... not poopy spree as I keep typing, I am sure that would not be anywhere near as much fun.. but Poppy Spree! 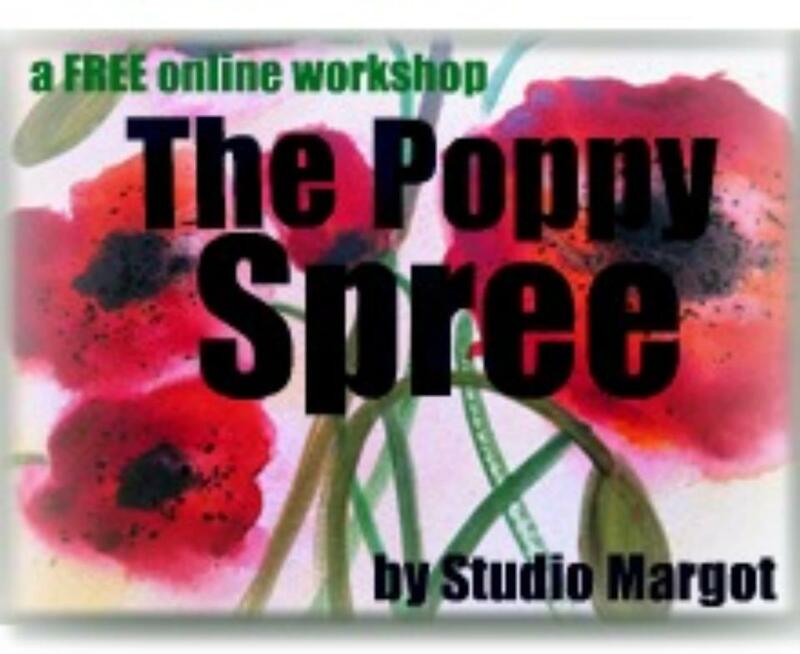 This is a wonderful free... yes you just read that magic word... free... four week workshop being run over at the wonderfully generous Studio Margot. Week one is behind us.... though it isn't too late to join us, and it has been a fun, very messy paint filled few days. You are guided through with wonderful notes and videos and it is just filled with such joy and community that it is something you should all be sharing in. The thing I love about this course, other than the actual course, which is not poopy at all, is that it has given me the chance to paint along side some friends. Now one of those friends lives many hours drive away, and another lives just 15 mins, but with hectic lives we don't get to connect in the real world very often, but through this course we get to paint together and post them up on the flikr group that has been set up and it is a pretty special feeling knowing I am painting with my friends. As an added bonus there is the new friends you get to make along the way! So if you need a little fun and mess and glorious poppies in your life, then why not come and join us!! Your post about owls had me laughing - I'll remember never to send you an owl card! You would never know you were so freaked out by them when looking at your fantastic owl... It is seriously wonderful - I love the looseness of it and the blurred text! I LOVE poppies! I had to double check to make sure I didn't put poopy! ha ha! Beautiful paintings! I waant to do this!!!! lovely - is the course still available online?